As Lagos state governor, Babatunde Fashola and state doctors continue in their dispute while patients suffer, the private sector has decided not to sit back and do nothing any more. The Punch newspaper reports that private doctors under the aegis of the Association of General and Private Medical Practitioners of Nigeria have earmarked 84 private hospitals in Lagos State where patients could get free health care services. This is great news and comes as a relief to Lagosians who have suffered a keen drop in availability of health care since the doctors’ strike started as many of them cannot afford the fees for private health services. The state chairman of the association, Dr. Olayinka Oladosu said, yesterday, that they decided on this goodwill gesture to make sure no more lives were lost while the state government negotiated with its sacked doctors. 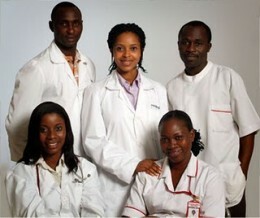 Oladosu said about 84 hospitals are participating in the scheme. To ensure that Lagosians don’t travel far distances to benefit from this scheme, the hospitals are strategically spread across the state. Only patients with the general hospital cards will benefit from this scheme. Oladosu also said the association had also prepared seven emergency centres in each local government. “We cannot sit back and go against the Hippocratic Oath that we have sworn to. Our colleagues in dispute should be assured that this move is not in any way to scuttle their negotiation with the state government,” he said. According to the Punch, the national president of the association, Dr. Anthony Omolola said doctors in the selected private hospitals would attend to general health care cases while complicated ones would be referred to consultants in the public hospitals. Some of the hospitals participating in the scheme include Maryland Specialist Hospital, Nusamin Hospital, Ericon Clinic, Havillah Clinic, and St. Patrick Clinic.